Carlie ArmstrongSo here’s one last housecleaning post before basically winding down for the holidays. Which isn’t to say I won’t pop back next week, but let’s not assume so. 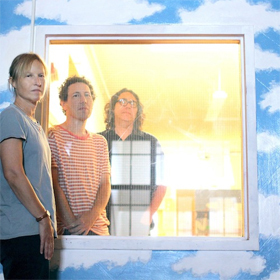 Happily, Yo La Tengo have made it easy to wrap things up – whereas most quiet down in December, the trio traditionally have their busiest run of the year thanks to their eight-night run of Hannukah shows at Maxwell’s in Hoboken. The combination of a tiny room and ridiculously cool opening acts and special guests have made the events instant sellouts, so those of us who don’t reside in or around the New Jersey area can thank NYC Taper for doing their best to document and share the proceedings. This year, they captured seven of the eight shows and have made them all available to download, so when you’re sick of Christmas carols, pick one and turn it up. And if you want more, Matablog reports that special mix CDs compiled by the band from their own record collections and made available at the shows will be put on sale online today and tomorrow with all proceeds going to Norton Records, whose Brooklyn warehouse was basically destroyed by Hurricane Sandy. Update: And night six is up. Collect them all! Looking ahead to the January 15 release of their new album Fade, a new video from the record was just released – yes, it’s a time-lapse of a tree not entirely dissimilar to the one on the album cover; it serves as a nice companion piece to the “Before We Run” clip released last month. There’s also a short interview with Ira Kaplan about the new record at DIY, and a gentle reminder that the band are in town at The Phoenix on February 9. And to keep it seasonal, here’s the Jan Terri cover that led off their 2002 Merry Christmas From Yo La Tengo EP. Because it’s fun. Exclaim has some details on the new Guided By Voices EP coming in the new year. It’s called Down By The Racetrack and will be available as of January 22. Fast Company Create talks to J Mascis and mixer John Agnello and Village Voice to Lou Barlow about why the Dinosaur Jr reunion has been so successful. Earlier this week, Bob Mould stopped by Reddit for an “Ask Me Anything” session. On March 1, he stops by The Horseshoe for face-tearing rock session. Some show announcements before people stop paying attention entirely… American lo-fi soul saviour Cody ChesnuTT brings his 2012 release Landing On A Hundred to Wrongbar on February 10, tickets $19.50 in advance. Nashville’s Caitlin Rose is at The Garrison on April 5 as part of a Spring tour in support of her new album The Stand-In, due out February 25. A couple of tracks from the record are available to stream. Brooklyn’s Caveman aren’t saying much about their follow-up to last year’s debut Coco Beware besides that it will be out this Spring, but they’ve already announced a tour to promote it. Look for them at Lee’s Palace on March 1, tickets $10.50. Memphis’ Lucero have graduated to the big rooms – the March 26 date of their Spring tour, still in support of this year’s Women & Work, will have them at The Phoenix. Tickets for that are $20. NYC Taper is sharing a recording of Sharon Van Etten’s secret show in Brooklyn last week and The Sydney Morning Herald a short interview. She’s here at Massey Hall on March 23 opening up for Nick Cave & The Bad Seeds. She & Him get animated in a video for last year’s A Very She & Him Christmas, confirming that releasing a Christmas album is one of the best business decisions – if also one of the worst artistic decisions – a musician can make. The 405 talks to Jack Tatum of Wild Nothing. It shouldn’t be a point of surprise – they were due – but it’s still exciting that Yeah Yeah Yeahs have confirmed a new album will be out in the Spring via Twitter. Bat For Lashes have released a third video from The Haunted Man. The Guardian talks to Natasha Khan about her 2012. Interview and The Village Voice talk to METZ. Not sure why it took so long, but Modern Superstitions’ solidly garage-rocking self-titled debut is now available to stream. And buy. Stereogum goes record-listening with John O’Regan of Diamond Rings. The Calgary Herald also has an interview. That’s it, hopper’s about empty. Have a happy and safe holiday season everyone. it’s actually the SAME tree that’s pictured on the cover of FADE. yeah? I eyeballed it but guess I didn’t take seasons into account. Neato.